The past years have witnessed the rise of technology and with this technology raised the importance of mobile phones. Unlike early times, phones are no longer left in a corner of the house but they accompany us everywhere. In fact, in recent years mobile phones have emerged from being a simple utility tool to a hyper operative tool, that has come as our savior in protecting us from boredom to advertising and promoting our businesses anytime, anywhere. The easy reach and extreme love for mobile phones brought it to the main focus of the present IT companies. The present world is moving fastly towards a complete digitized world where more and more people are opting for advanced technologies such as laptops, smartphones, and tablets, to make their life fun and safer. The increasing passion towards mobile phones and tablets has gained the attention of various telecom operators, because of which they have started working in coordination with the different mobile companies to bring better as well as advanced astute interface along with the higher speed internet for the comfort of the consumers and so that they can enjoy the services at an extraordinary level. Past few years have witnessed the evolution in the fields of utility and productivity tools, games, data-editing apps, and much more, bringing all forms of information just a click away, connecting your work and world in a single thread and all this has become possible just because of smartphones. Especially in a country like Mauritius which is known for its tourist spots across the globe, mobile apps can prove to be the biggest boon. Whether it might be a small company or a big firm, mobile apps have shown their importance by bringing remarkable growth in all businesses, as well as by enhancing the quality of the customer services. Communication with customers has become much easier. Even though most companies possess websites and have better and advanced responsive websites still there is no point in missing out on the mobile audiences. Mobile applications work as a leverage while having access on-demand pieces of information as well solutions to all problems. B2B and B2C apps are having almost equal exaction on the present market. Some companies are even planning on introducing native apps that are completely customized according to the core business requirements. The sole purpose of these apps is to form a bridge between different teams and segment of the company. Though there is a high probability that these apps might not be available for public use but within an organization, these apps hold great importance. Use of mobile apps in industries like ticketing sites, Banks and Financial institutions, Hotels and Restaurants, Hotels and travel companies, etc. 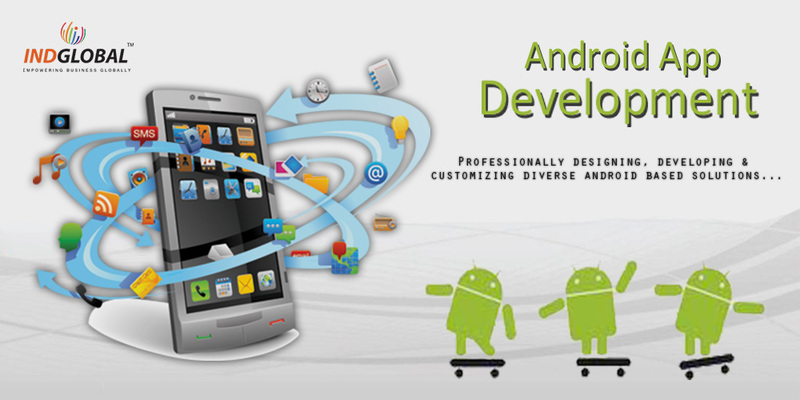 have timely proven how important and beneficial mobile apps can be by bringing a hike in the business. These apps take you to a greater level of completion with the confidence of conquering it. With more companies indulging in mobile applications in order to promote their businesses, the demand for mobile apps has grown to a newer extent and is still growing with no stopping in near sight. Still, if you are worrying how to get a mobile app for your company the flush out you\r worries and approach IndGlobal Consultancy Solutions which is an India based start-up and has spread its wings to Mauritius as well. From designing apps on all platforms from scratch to upgrading the apps, be assured that at IndGlobals you will be provided with all possible assistance and solution as for IndGlobals, customers satisfaction is the foremost motto.